The seven-year old José António wasn’t happy with the nickname he got when he started learning capoeira on the streets of Vila Boa, in the north-eastern state of Goiás, Brazil. He was nicknamed Minhoca, ‘little earthworm’, because he was skinny, small and flexible. The other boys had nicknames like Tiger, Snake, Phoenix. His teacher explained to Minhoca that it’s for him to get stronger. A name means nothing if you don’t work to make it meaningful. Almost 25 five years later, the ‘little earthworm’ is the only one of that group still practicing capoeira. 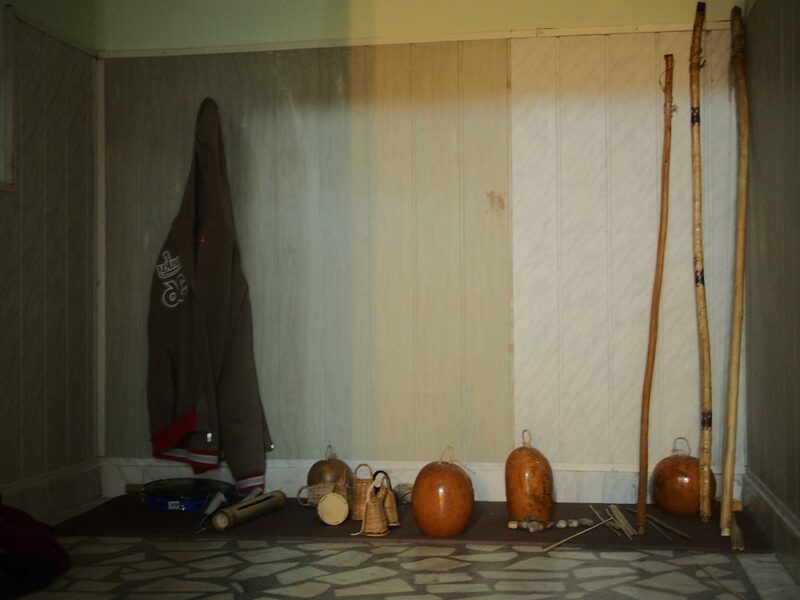 He is now teaching others the Brazilian martial art of capoeira, in a rented house in Bucharest. “You better decide fast how many Shawarmas you want to order, because it’s very crowded tonight, and you’ll have to wait an eternity,” the woman tells the group of ten people who have just arrived at the Kebab restaurant in the Iancului area, in Bucharest. She is witty and without many pleasantries. Minhoca and his students have finished their training and have come to grab some food after all the effort they had put in the capoeira class. It’s a Friday evening, beginning of May, but it’s still cold outside. Adina, one of the girls who also attended the capoeira class, can’t join the group in the restaurant because she is carrying two little puppies that she found in the street and she’s not allowed to take animals inside. At the end of the Capoeira class I’ve been witnessing from the sideline, watching with awe how people exercise on the checkerboard floor, their bodies strained, but in harmony with the music, I ask Minhoca Alemar if he has time for an interview. He said yes, sure; but he didn’t mention that the whole group would join. So, in about 15 minutes, I was among Minhoca and his students in the kebab restaurant, doing my first group interview. It seemed weird at first, but after a while, it felt natural. Not only are they as close as a family, but also Minhoca’s life in Romania was closely related to theirs. Minhoca’s first capoeira class was open air, in the streets of his hometown Vila Boa, as the organisers didn’t have enough money to pay rent. It was the beginning of the ‘90s. Life in Brazil was quite hard in those days, the now 32-year old man says, and capoeira was more aggressive. Capoeira started off as a fight disguised in a dance, and it’s synonymous with the history of slavery in Brazil and the slaves’ search for freedom. In the 16th century, Portuguese colonists brought slaves from West Africa to work in the wide and wild territories of Brazil in the production and processing of sugarcane. The conditions in the large sugarcane farms were terrible, and in the evening, the slaves would train in their crowded living spaces, combining music, dance and martial art moves originating from Angola. It was essentially a fight, which they later used, when they ran away from the farms and established quilombos, primitive settlements in hard-to-reach places. At 17, Minhoca became an instructor himself. It was only then when his father first came to see him performing. Valdiverde had disagreed with his son’s decision to learn capoeira, which he considered too aggressive. It was his father who taught him that what you gain can easily be lost, but what you work for, it’s well deserved. Minhoca now tries to pass this wisdom to his students. During the class I attended, he gave a girl nicknamed Cabeza, one of his students, a yellow cord, the symbol that she has reached a certain level in the practice of capoeira. The girl’s face was red from effort and emotions, her eyes were shiny and she hugged Minhoca. Capoeira became more popular in Europe when tourists started going to Brazil towards the end of the ‘90s. The masters began organising bigger schools, and the practice of capoeira became less bellicose, more like a combination of dance and martial arts. Its aggression had to be tuned down, so that it suited more people. In 2008, Minhoca, then a man in his ‘20s, with strong arms and some hardly visible scars on his face from the days when capoeira was raw and aggressive, but with a soft voice, came to a Bulgarian resort on a two-year contract. He performed in a show combining capoeira elements with other dance elements originating from Africa. During his stay in Bulgaria, he met a Romanian guy who said that he would help him start a capoeira school in Bucharest, and that he’d have a place to stay. But that guy never picked up the phone again, so Minhoca found himself in Romania: a country where he didn’t know anybody. He had to build everything from scratch, and along the road he met some of the people that now are his students. 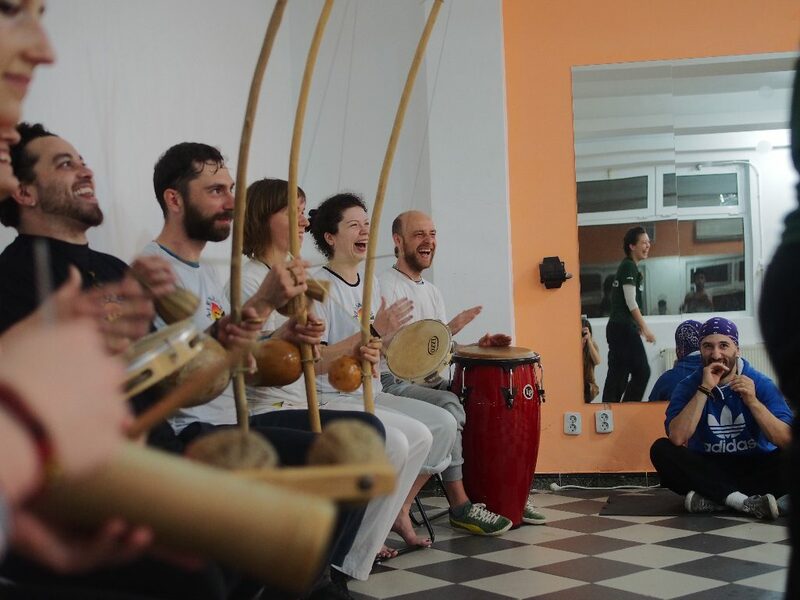 They helped him create the capoeira school in Bucharest. “Minhoca and I didn’t get along in the beginning,” says Summer Wood, a Dutch-born girl who teaches English at a school in Bucharest. They had different personalities, and it was easy to misinterpret each other’s behaviour. 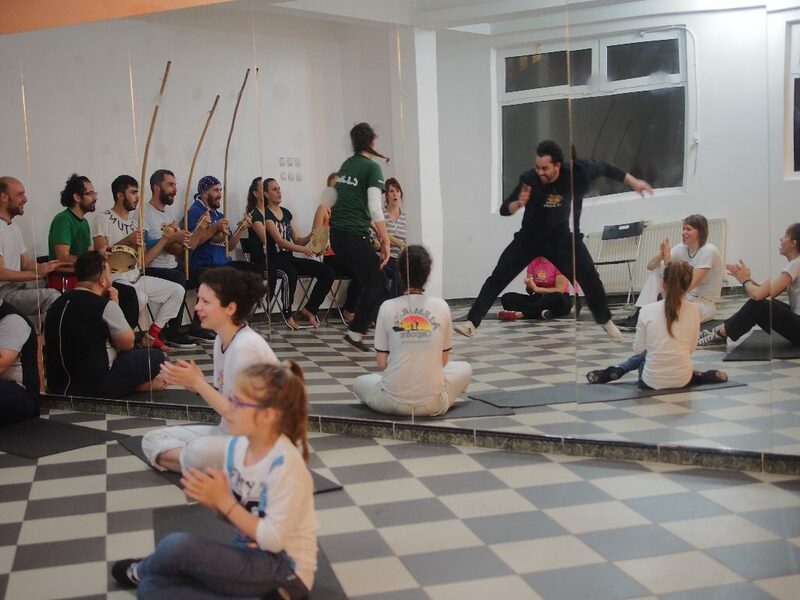 Several years later, they are best friends, and the capoeira class is the reason why Summer has stayed in Bucharest. She’s sitting next to Minhoca at the Kebab restaurant in Bucharest. A few chairs away, a young man called Miki says that in his early teen years he was aggressive and would hang out with other teens who were fighting all the time. His mom told him to start capoeira classes. Miki is now a capoeira teacher for a group of kids, and his house is a place where Minhoca and some other core members of the capoeira class hang out. Meanwhile, Minhoca has started two other schools in Italy and the Republic of Moldova. When he’s away, some of the old members take care of everything. Minhoca’s father Valdiverde doesn’t mind that his son lives over 10,000 kilometers away. He only cares if his son is ok and he’s happy with his choices.